Sculpt from plaster interesting and exciting. You can sculpt anything, from doll heads to the interior decoration. This activity is for adults and for children. And it's not as difficult as it might seem at first glance. In any case, a simple fruit collages and wreaths can make almost any. Gypsum powder, clay for making shapes, watercolor paint, water, varnish, brushes. Method # 1. Only a quarter of an hour can make a wall plate with decoration in floral patterns. With this purpose, take post cards with pictures of flowers. Flowers cut with scissors along the contour and cut out a picture of water, then put it on the bottom saucers of medium size face down. 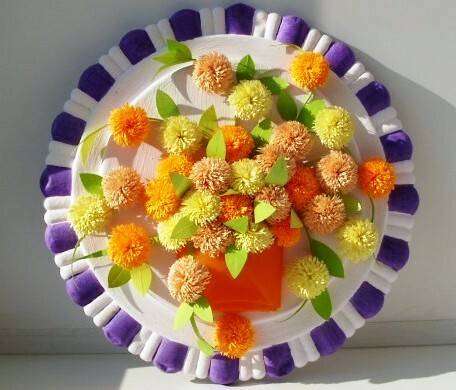 Flowers should be filled with all the flat part of a saucer or plate. Now mix the plaster and pour over the dish a layer of 1-1,5 cm, to achieve the formation of a correct circle. While plaster does not harden, insert a rope loop, to the finished product can be used as wall decorations. After a good plaster hardens, carefully peel off the print. Trim uneven edges with a knife and the product is ready. Method # 2. Make appropriate forms out of clay. If the relief plasticine sketch complex shape, involving a large number of protruding elements, then make the team in the form of several parts that will facilitate the process of taking shape with the finished product of gypsum. In order to do this, divide the sketch into its individual parts. Then mark on the clay throughout the entire product line of connector and push into the clay plate of copper foil to avoid sticking of parts during the hardening of gypsum. Use a thin foil, since the rough sections will need to trace on a curved path. Then proceed as follows:- Grease the edges of the forms with vegetable oil to facilitate extraction of the finished gypsum products;- gypsum Mix until creamy state;- Fill the form. Do this very slowly, constantly tapping the form on the table to randomly formed bubbles of air rose to the top;- After curing the finished product, remove it from the mold and paint with watercolors in accordance with the idea;- after two days of paint products;- Put the cooked fruit in a decorative basket or insert a panel in a frame and decorate the interior.